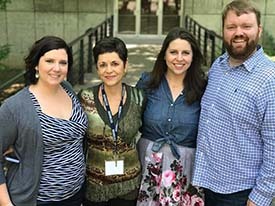 The 2017 NATS Intern Program has been a transformative experience for a select group of 12 voice teachers and three collaborative pianists. (Posted 6-13-17) As expressed by the inimitable Warren Jones, one of this year’s Master Teachers for the 2017 NATS Intern program: “Music will not let you down.” Music can transform us, and this is ultimately why we as NATS members choose to sing and to teach others to sing. This transformative power has been palpable throughout the past week at the NATS Intern Program: in my fellow interns collaborating to make music and teach our students to use their voices well, in the master teachers who have helped us grow as pedagogues and technicians and performers with even higher standards, and in the students who each brought their unique spirit and willingness to learn and grow as vocalists. The perfect storm of teamwork, vulnerability, and high expectations has encouraged us all to blossom. Coupled with the extensive vocal literature resources donated by publishers, authors, and composers, I know we will all leave Toronto energized to continue this important work! 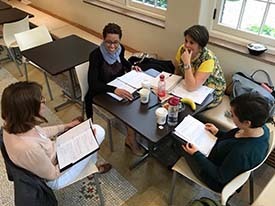 -- Tara Nixon, 2017 NATS Intern - pictured (on right) with (l to r) interns Michelle Markwart Deveaux and Katherine Jolly, and master teacher Mary Saunders Barton. (Posted 6-6-17) The 2017 NATS Intern Program is off to an exhilarating start. “We interns have already been pushed outside of our comfort zones as teachers and performers,” said Bridget Moriarty. The selective program includes 15 NATS interns, including three collaborative pianists, taking place this week at the University of Toronto. 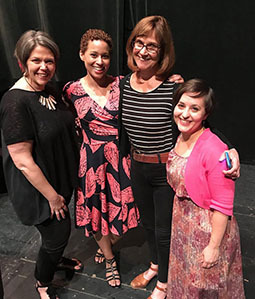 "The master teachers have wasted no time imparting their wide and varied breadth of knowledge upon us demonstrating techniques in both the classical and music theater styles. The new collaborative piano program is equally beneficial to the teaching interns as we continue to learn and address skills that help our students become more artistic collaborators, while the collaborative piano interns gain field experience accompanying lessons and masterclasses. We finish each day filled to the brim with new knowledge, trying to soak up as much as possible in our short time with our master teachers. Given the excited talk and expressive work seen already, this week will continue to be transformative for everyone involved." Special thanks to the ultimate photo guy Dann Mitton from University of Toronto, for providing photography throughout the week. VIEW our photo album on NATS Facebook.